I am totally one to pile makeup on my face. What can I say? I love the stuff. Black lipstick? Into it. Blinding levels of highlighter? Gimme. Five hundred coats of mascara? I'm on board. That said, I've always enjoyed a pretty natural skin look. I have a face full of freckles (which I love! ), so while it's fun for me to play with color and shimmer, concealing my complexion has just always seemed like a step backward. I want my makeup to exaggerate my positive features, not camouflage them. Not to mention, I have a damaged moisture barrier in certain parts of my face (nose, forehead), so many formulas result in nothing but flakiness. So, for a long time, I was strictly of the BB cream class. But then this little thing called hormonal acne crept up on me (on my chin, specifically), igniting my motivation to find a fuller-coverage option that would neither flake out my skin nor completely hide my freckles. If I had to go the foundation route, I knew I needed a hydrating, water-based one. And I tried a number of recommendations to no avail. 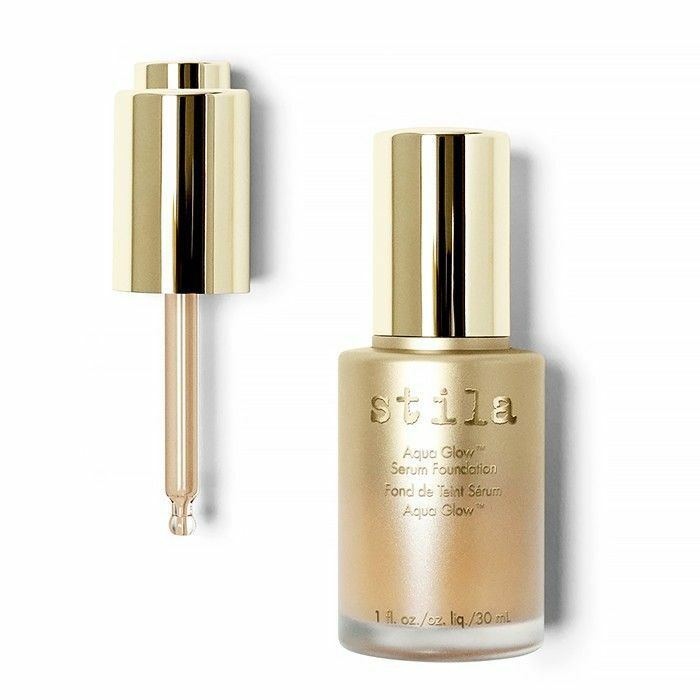 But then I discovered Stila's Aqua Glow Serum Foundation ($45): dare I say, the holy grail foundation for foundation-phobes everywhere. This stuff is magic for so many reasons. First, the formula is perfect for my moisture-challenged skin. It's packed with water, glycerin, and hyaluronic acid, and it is the only foundation I've tried that actually makes my skin feel more hydrated instead of less. At the same time, it doesn't clog my pores or aggravate the blemishes that now take up monthly residence on my face. It's also lightweight and buildable, meaning I can adjust how much coverage I want, while never feeling like my face is caked in crap. Plus, the finish is exactly what I wanted: luminous and youthful, thanks to the light-reflecting pigments in the product's formula. Now, I certainly don't wear this stuff every day—just when I know I'm going to have my photo taken or for special events. But I'm oh so glad I discovered it. After all, it's good to overcome your phobias. What's your absolute favorite foundation? Let us know in the comments below!